You’ll receive Exclusive Offers, Holiday Reminders, and New Gift Alerts. "This is the 3rd or 4th Birthday Basket I've sent to friends and each one has had the same reaction. They love the cake, the fruit, and the presentation. Highly recommended!!!" "I sent Organics in Bloom to a friend with a broken leg and this was her response: This is SO BEAUTIFUL! How touching. Thank you so much. This lifted my spirits." 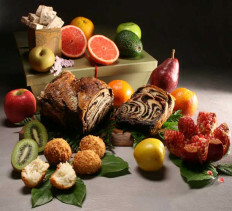 We select only premium quality fresh fruit and use artisanal foods made by producers we trust. We are inspired by the beauty we find in nature and classical art when we create our gifts. We listen to your needs and guide you every step of the way when you choose to send a gift from us. We are gifting professionals with three decades of experience hand crafting luxury gift baskets that appeal to all tastes. We help you make the right impression. Need assistance with your gift? Our Gift Advisors are happy to help you. When you have a specific occasion to shop for, we offer gift baskets for every occasion. 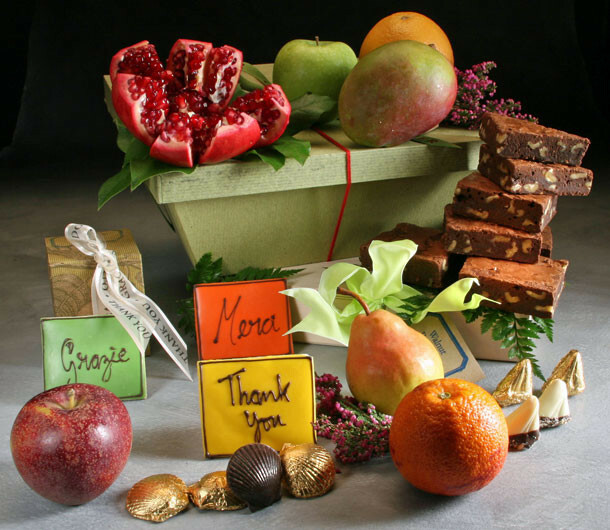 Thank You Say thank you with a unique and tasty thank you gift basket filled with fresh fruits, nuts and chocolates. Delivered nationwide, our gift baskets are perfect for friends, family, coworkers, or clients. Birthday Shower a loved one on their special day with a unique and scrumptious birthday gift basket. From decadent cakes and baked goods to healthy fresh fruits, you’ll find the perfect birthday gift basket. Congratulations Hooray! Cheers! Congrats! It’s time to celebrate! Send your best with a cheerful congratulations gift basket. 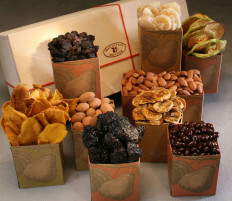 Any of our delicious congratulation gift baskets are a big pat on the back. Get Well When someone you know is feeling under the weather, you can make all the difference by showing you care. 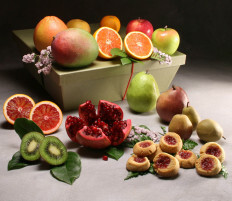 Send a thoughtful get well gift basket filled with fresh fruit and handmade cookies with get well wishes iced on them. Sympathy Express your condolences during times of sorrow with a comforting food gift basket to show just how much you care. We’ve detected that you have clicked your own referral link. Please note that any purchases made will not qualify for a reward. Refer your friends to earn rewards!